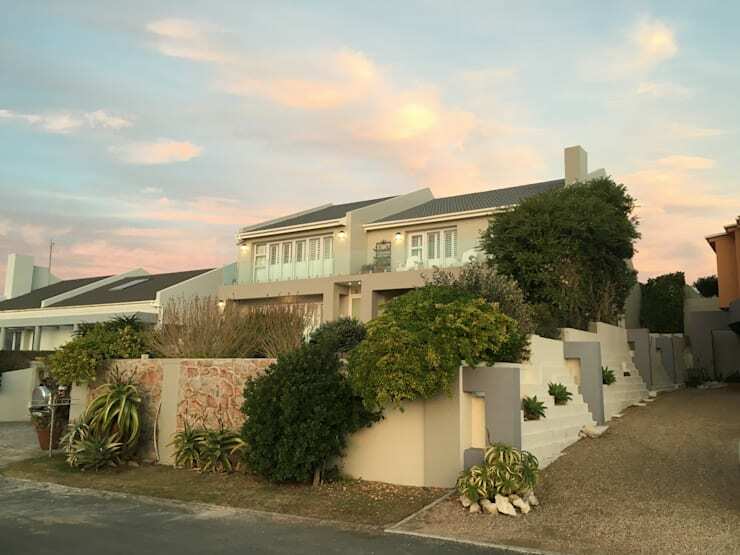 Today, we are going to visit Hermanus in the Western Cape where design professionals CS Design have revamped a 450 square metre holiday home that is simple spectacular. As we explore this home today, we will see what a state it was in before the renovation—old-fashioned and unappealing. The home's potential was completely wasted! We will also see how there was no real design scheme. Everything was cluttered and crowded together, with personal items all over the place. Yet a holiday home is meant to be a relaxing space that is serene and peaceful. Let's see just what it takes to make a holiday home a true get-away where a family can relax and unwind! In this image, we can see how much work went into the renovation of this holiday home. It wasn't simply a case of repainting it. The designers shelled the entire space, pretty much starting from scratch while making the most of the original structure. In this image, we can also see how much work goes into a renovation. There are ladders everywhere and the space is in total chaos! In this image, we can see how outdated and old-fashioned this home is. The colours are pale and washed out, resulting in a visually unappealing facade. The structure of the home is fairly decent, however, with clean lines and modern finishes. This gives the designers a lot to work with. We can also already see how there is a lot of natural light flowing into the interior space thanks to the large glass windows and doors. This also provides a wonderful base to work from. 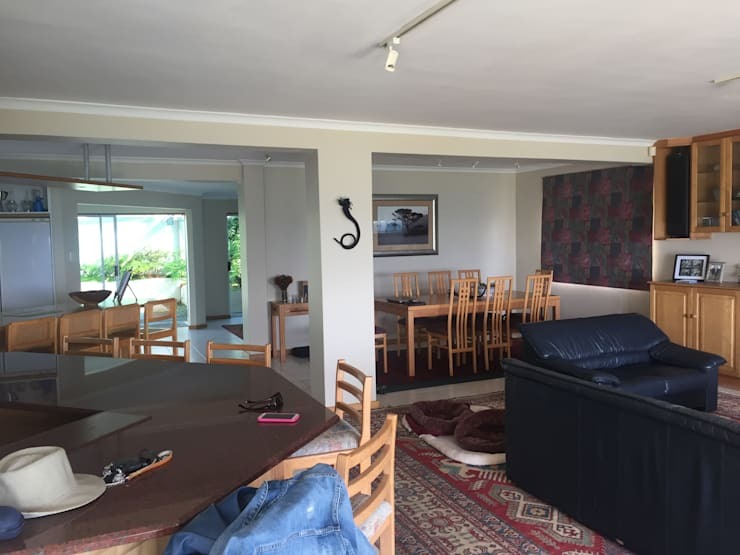 The interior design of the home is very shabby and haphazard with different colours, patterns, textures and tones thrown together throughout the open plan home. The living room features a blue leather sofa and a red patterned rug, which totally clash. There are also personal items scattered all over the home, making for a very messy and unappealing looking design. The artwork and furniture are also very old-fashioned, which does nothing to enhance this interior design. It looks like we've stepped into our grandparent's home! In this image, we can see how the designers have put together a plan for the holiday home. This outlines the renovation very carefully, allowing the home owners to see exactly what the designers have in store. This is always a great tip when it comes to a renovation or redesign. 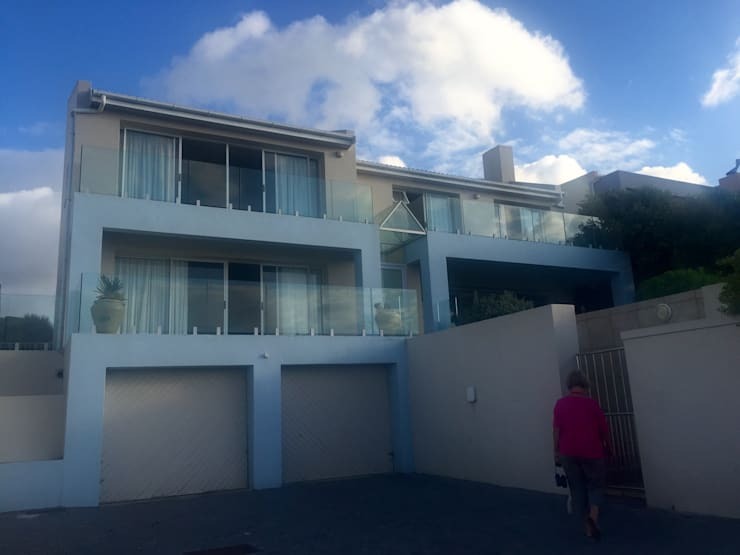 It ensures that there are no surprises for the home owners when the final product is revealed. 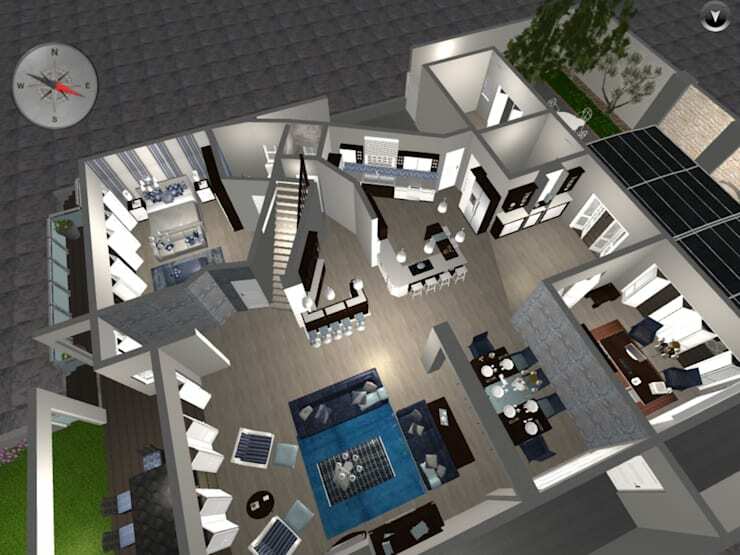 In this plan, we can see that the designers have plans for a fluid living space where the rooms flow into one another. The designers also have grand plans for modern furniture and more stylish finishes. 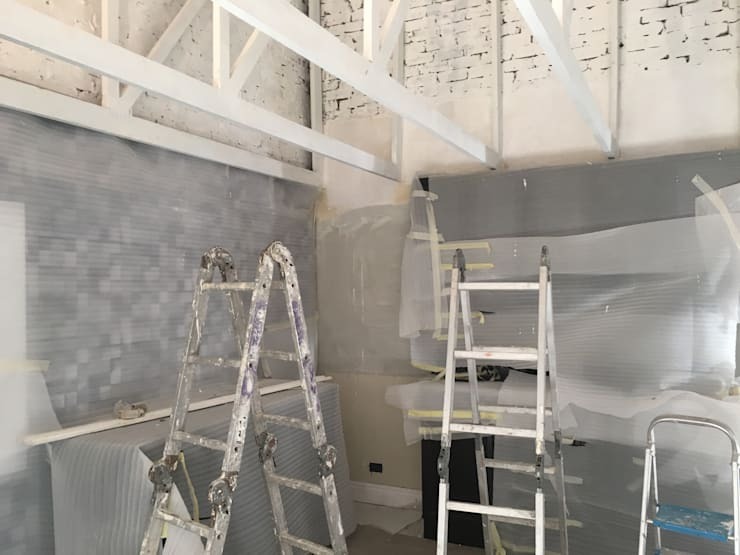 Aren't you excited to see what the finished result will look like? If we look at this image, we can see that the facade has been completely enhanced with a more stylish, charming and homely finish. The designers have introduced grey and beige tones, which work in harmony with the stone cladding. This brings a rustic look and feel to the space. The designers have also completely enhanced the design by utilising plants, trees and flowers. The greenery brings a breath of fresh air to the facade, integrating nature into the style. 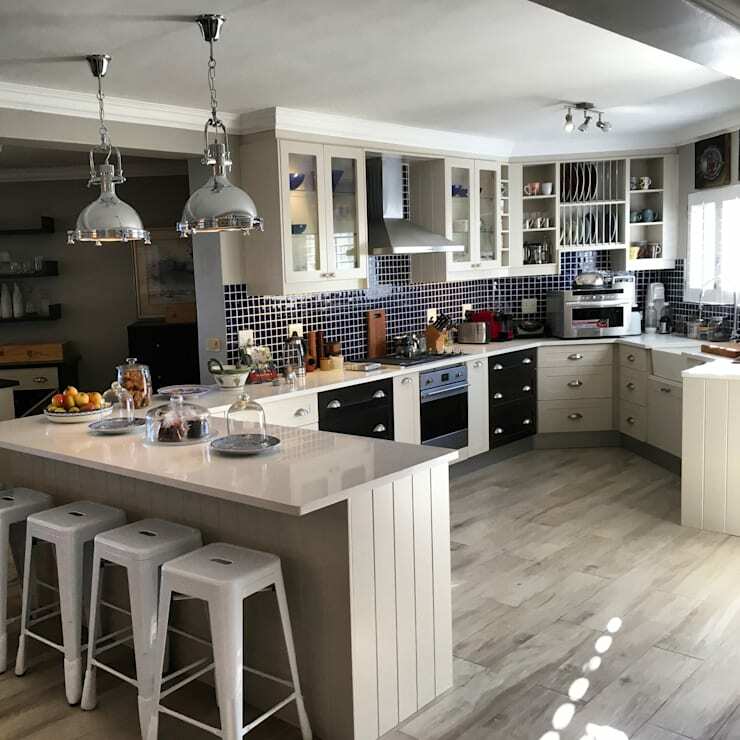 If we head inside the home, we come across an open plan kitchen that is homely and warm, truly becoming the heart and soul of the house. The designers have gone for light wooden flooring and light furniture, which contrasts beautifully with the dark blue tiles that have been introduced into the home. Natural light floods into the room, creating a very bright and expansive looking home. The cabinets and shelves provide plenty of storage space in the kitchen, allowing the home owners to keep kitchen items stored neatly out of sight. Yet we can see that they've kept some items on the counter tops to create a bit of charm and homeliness in this area. You may be interested in these 8 clever to improve storage in your kitchen, however. 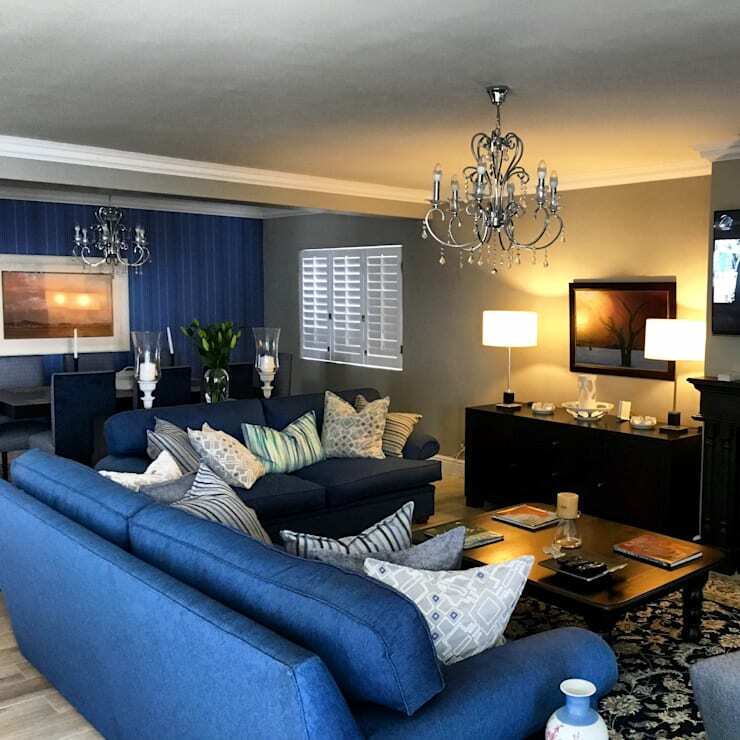 The living room retains the same decor scheme that we saw in the kitchen, with dark blue tones introduced for a bit of warmth and charm. Already we can see that this a much more modern and consistent design scheme used throughout the interior design, with the contemporary furniture working in harmony with one another in all of the living areas. The dark blue sofa features patterned cushions, which bring charm and texture to the environment along with comfort and style. In fact, we can see how the design and decor used throughout the home introduces charm and trend. Don't you love the elegant chandeliers, which add the finishing touch to this beautiful, lavish and comfortable home? 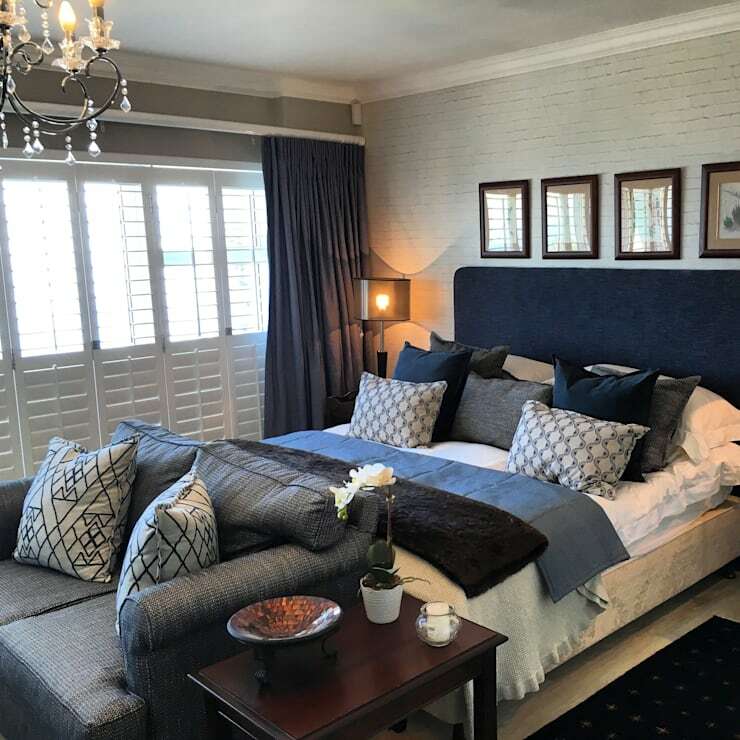 The bedroom is just as lavish and cosy as the rest of the home with different blue tones introduced, complementing the detail and design of this space. Remember that your bedroom should be a place of serenity and peace. Blue is the perfect colour for this! Have a look at these tips on: How colours influence your bedroom. A sofa has been added to the bedroom, which is quite unusual. However, it provides a space for reading a book or relaxing with a cup of tea without having to always lie on the bed. 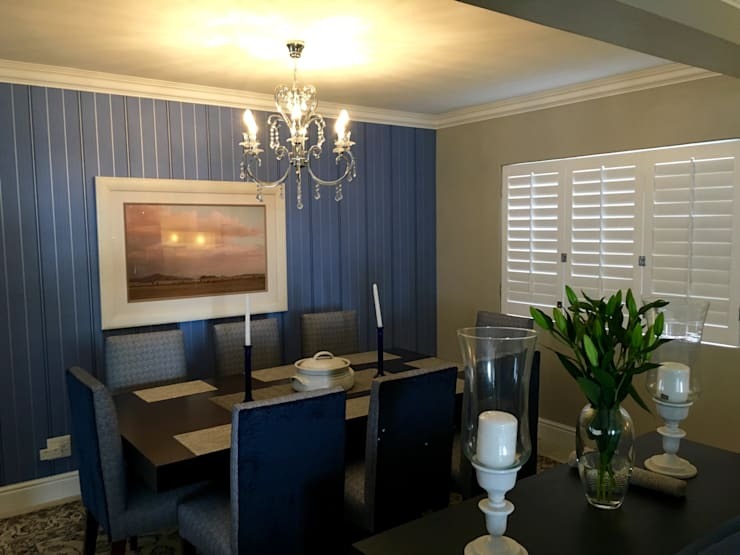 We end off our tour in the dining room, which features the same blue tones that we have witnessed throughout the home design. In this image, we really get a sense of how its the finishing touches that make all the difference in a home design. A vase of flowers introduces a breath of fresh air into the home while the artwork brings in beauty, charm and personality. The candles on the dining room table ensure that while dining, there will be plenty of ambiance and even some romance! If you've enjoyed this ideabook, you'll love these: 5 home hallways renos to impress your guests. What do you think of blue as a holiday home interior colour palette?